The Brazilian working class is mobilising to shield Lula against arrest, and to return him as president of the country. 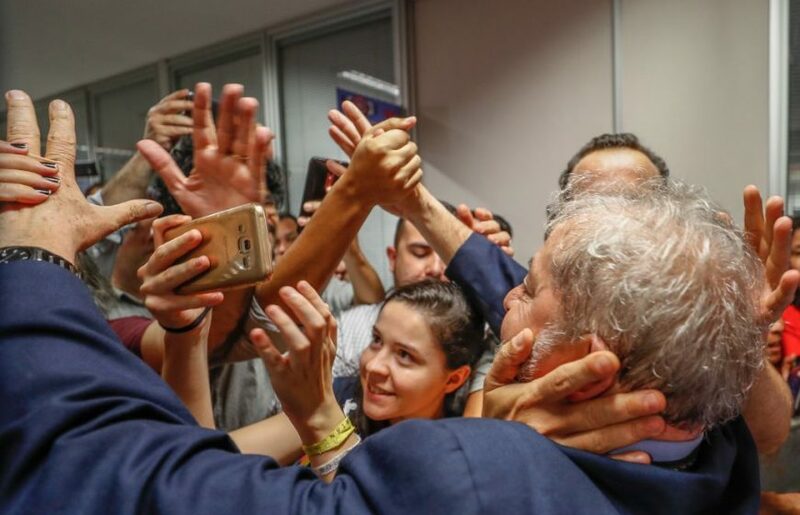 On this 6 April 2018, Luiz Inacio Lula da Silva – presidential candidate in the October elections and assured winner – was summoned to surrender to police within hours to start a 12 years prison sentence. Twelve years in prison about a case where Lula is supposed to have benefited of a seaside apartment is an absurd pretext and a clear act of class vengeance on the part of the Brazilian and global capitalist class. It is a coup d’Etat hardly disguised, with the right wing of the military waiting in the wings. The working class of Brazil is mobilising to protect Lula. At 72, Lula is de-facto condemned to finish his life in prison. This is an entirely despicable and odious measure against a man who gave his life to the task of empowering millions. A working class leader who stopped private capital appropriating the collective property of the State – the perverse aim of global capital being to speculate on collective property and enrich further a handful of insanely rich individuals. This coup aims also at Argentina where a similar process is taking place. But there is a strong working class in Argentina as well. And Latin America has tightened its internal solidarity in the last years. Posadiststoday.com denounces this attack on Lula. It represents a political coup in Brazil, this time through the corrupt manipulation of the legislative apparatus of State. It is done in this way because the capitalist class has no longer the social authority to launch a direct military coup. Senator Lindberg Parias for the Workers Party, the PT, declared this prison sentence “illegal”. And he did not accept that Lula should give himself up. “Let them come here” he said, referring to those who want Lula behind bars. One of the reasons for this attack on Lula is to stop him becoming President in October. Should he be absent from the polls, Brazil faces the danger of ex-army officer Jair Bolsonaro (a fan of the 1964 coup) reaching government through elections arbitrarily deprived of their main candidate. The strong working class of Brazil has already created a front of resistance with the rest of the Brazilian masses. A sector of the soldiers is aware of the danger and does not support this coup either. Amongst the thousands who mobilise in the streets of Brazil, the slogan is : “Lula will not surrender!”. In Britain, let us support the Fora Temer ! calls.